The UVB-100 Low Temperature Water Desorption System uses UV radiation to provide light energy to water molecules on vacuum surfaces in order to overcome and desorb the water bonds so the water molecule can be pumped from the system. 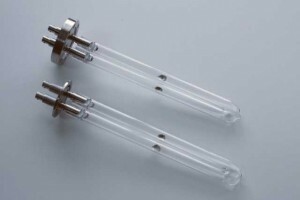 To use the UVB-100 in your UHV system, locate the emitter probes in the high vacuum chamber. The electropolished walls of the UHV chamber will help reflect the UV energy to areas that are not in direct site of the emitter. 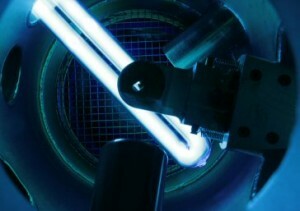 Layers of water vapor molecules formed on the inside of high and UHV vacuum chambers can be desorbed or displaced by energizing them with ultra-violet (UV) radiation in the range of 190 to 200nm. This provides enough energy to break the covalent bonds of the water molecules. 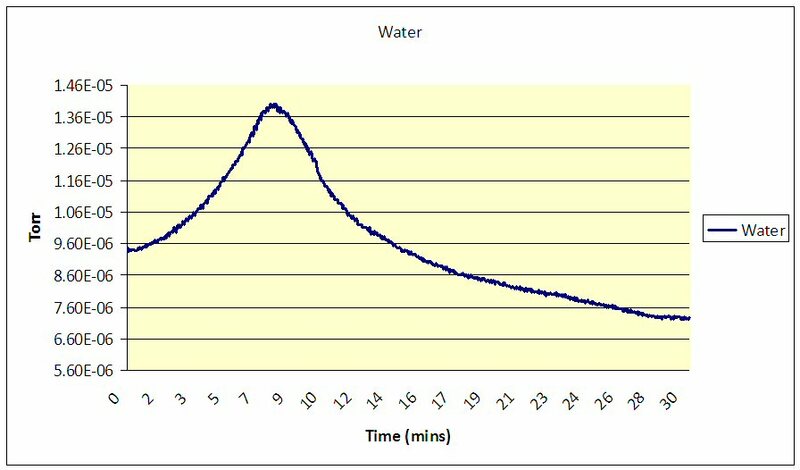 The two graphs below demonstrate the effect of UV energy on water, hydrogen, oxygen and CO2. In this test, the UV emitter was turned on for 8 minutes and then turned off. 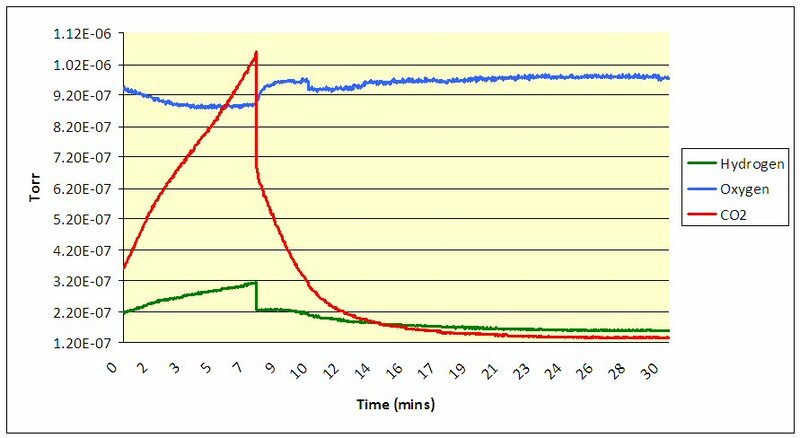 Results shown on the graphs demonstrate that the water vapor desorption rate increased during the UV ON time and then dropped off quickly when the UV was turned OFF. The second graph shows increases in H and a significant increase in CO2 as well as a reduction in oxygen during the UV ON time and a corresponding decrease in CO2 and H when the UV was turned OFF. The graph shows CO2 will vary with the amount of hydrocarbon available for reaction with O free radicals and O3. Schoonover will allow you to rent our unit for a 30 day trial. We have a rental rate of $425 per month. At the end of the 30 Days, you either keep or return. If you purchase the unit, we credit you the $425 rental. To rent the UVB-100, simply go to the contact page and send a message to us or send an e-mail to info@schoonoverinc.com. Q. Is a polished inner chamber wall required for even distribution, or does non-polished stainless steal or aluminum also reflect the UV significantly? A. It does not need to be polished, but if the chamber wall is coated or black the UV will not reflect. Q. How many UV emitters do you use for which chamber size? Q. How many emitters are possible per controller? Q. Is the controller remote controlled? A. It can be turned on with a variety of DC or AC control voltages. Q. What are the safety meaures required – special windows, interlocks, etc.? A. If you have quartz or fused silica view ports, shields are needed because the UV can get past the glass. We carry those in stock. The controller also comes with a lock out key so that it cannot be turned on without the key. Q. Is the emitter compatible with relatively direct irradiation from in-vacuum IR lamps? A. That depends on how close the UV emitter is to the IR lamp. It is bakeable to 200C. Q. How does the UV impact the wiring and polymeric materials in our chamber? A. The UVC energy from the emitter is low power and does not affect typical vacuum materials such as Teflon and Viton. Q. What is the wave-length or the wave spectrum? A. The primary wavelengths are 254nM (70%) and 185nM (30%) for the standard emitter. Q. What is the maximum temperature that I can bake out my system to? A. The maximum radiant bake out temperature for the standard emitter is 200 degrees Celsius. The limitation is the electrical feed through. Q. Since there is Mercury in the emitter, what happens if I drop a sample mount on the emitter and break it? A. There are a wide range of mercury spill kits available, and also Indium foil acts as a getter for mercury vapor. However, if care is used on the placement of the emitter then the emitter would not be in danger of breaking. It is also possible to place a shield between the emitter and specimen stage to protect the emitter with minimal reduction on performance. Q. What are the primary differences between using IR or UV to desorb water vapor in a vacuum chamber? A. The primary difference between using UV or IR to desorb water are 1) heat – the UVB- 100 does not significantly heat up the chamber or mechanical parts, and 2) IR requires a direct line of site where as UV can reflect off the inner surfaces of the vacuum chamber. Q. How much UVC power do I need for my chamber? A. The typical run of thumb is 0.4mw of UV power (254nm) / cm2 of surface area, or 2.5mw per square inch. The chart below gives some helpful values for common sizes in inches.